Goodreads Description: Sixteen-year-old Starr Carter moves between two worlds: the poor neighborhood where she lives and the fancy suburban prep school she attends. The uneasy balance between these worlds is shattered when Starr witnesses the fatal shooting of her childhood best friend Khalil at the hands of a police officer. Khalil was unarmed. 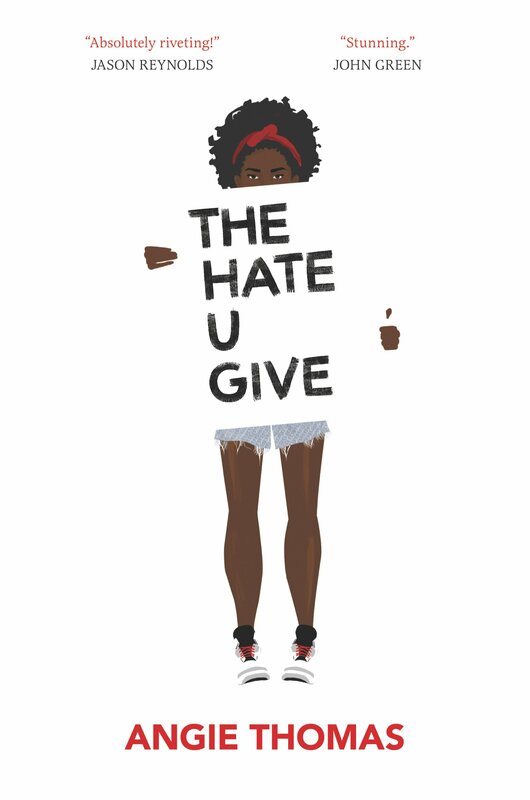 My Review: The Hate U Give is a once-in-a-lifetime book. It lives up to every bit of hype and has already wowed readers across North America. I remember way back to the Publisher's Marketplace announcement of this deal, and I thought to myself, "This one's going to be special." But this is more than just another good book. This is one of those cultural shakers. This is a book everyone needs to read. From the first page, we're immersed into Starr's world in Garden Heights. The author uses a perfect amount of description to set the scene, evoking all the senses to bring the reader into the moment. Starr's voice leaps off the page and brings the story up to another level. It is the perfect balance of slang and "accented" writing that not only reveals Starr's personality, but gives the book its own unique flavor. The book uses African American Vernacular English (AAVR) beautifully, and Starr even takes time to reflect on her use of it and how she switches to "proper English" at her white school in an attempt to avoid being seen as "hood." The writing doesn't waste time on flowery phrases, but hits hard with clever word play and to-the-point sincerity. The writing in this book just wraps you up from the first page and doesn't let go until the last. This book is also straight #ownvoices, as the author is black comes from a neighbourhood like Starr's. Writing aside, what makes this book so special is the story itself. It hits all the right notes, addresses all the right points, and explains things in a sincere way that helps to piece together the picture of black Americans and police violence. Even as something as simple as the feeling when a friend unfollows you on social media was explained with such an on-the-nose honesty. Not only does it address the varying sides of a complex issue, but it cuts straight to the point. It doesn't shy away from black on black violence. It's not a case of white-cops-vs-black-kids, as Starr's uncle is a cop and black cops take part in some sketchy and abuse-of-power situations. And it beautifully shows how situations can escalate into protests and riots, like what has taken place all over the United States. It also shows the white ignorance in several different forms, from the disconnect at Starr's school right up to some of her close friends, who simply just don't get it. This is not a biased look at the situation. It carefully analyzes all angles and presents a very nuanced look at the events that have launched #BlackLivesMatter. As I work in mental health services, I always look at books with an eye on mental health. THUG does an excellent job of portraying the post-traumatic stress that Starr experiences. She doesn't walk away from the shooting with just a few nightmares-- she cycles through the stages of grief, experiences anxiety that affects her day-to-day life, and copes with the difficult emotions that follow from grief and from the trial. Despite that, her trauma doesn't hold her back from speaking out for Khalil, and it shows why even the strongest people can be overwhelmed by traumatic events and may not react how they expect to in the moment. Yet under all the intense tackling of social issues, THUG is a heartfelt story of a girl caught between two worlds and the loving family that supports her through it all. I have a particular love of Starr's father, who is strong, outspoken, comes with a troubled past, and yet has such raw love for his family and community. Every character is beautifully balanced between good and bad traits, and the book plays around with themes of perception, not only in regards to Khalil and how the media portrays him, but how Starr portrays herself between her neighborhood and her school. The kids are so real and so fun that it really makes me sad to know they're only fiction. “Once upon a time there was a hazel-eyed boy with dimples. I called him Khalil. The world called him a thug. He lived, but not nearly long enough, and for the rest of my life I'll remember how he died. I could talk about this book for days. If you read anything this year, this decade, or in your entire life, then make it this one. TL;DR: 5/5 stars. As John Green put it, "Stunning."